Ryan Lester lined up from 20 metres out, directly in front. Feeling exhausted after running hard to find space in the forward 50 to receive a flawlessly placed Rhys Mathieson pass, he took a few deep breaths before composing himself and starting his routine. A chorus of boos filled the 41,000 strong crowd, but most of the fans in attendance assumed an obvious result for the home side. As soon as the ball dropped from hand to foot, however, it was apparent that this set shot was destined to hang left, squandering a wonderful opportunity to bridge a two-goal gap early in the third quarter. For most of this contest, Brisbane were treading water and the inevitable was going to happen at some point. Their fighting spirit would dissipate and perhaps another game they seemingly had a chance to grasp would slip through their fingertips, or so it seemed. If you’ve viewed a Brisbane game over the course of the last four months, you will have picked up on Chris Fagan’s demeanour in the coaches’ box. Perhaps the most glaring sign of emotion came in that exact game in Round 15 at Etihad Stadium, where the rookie coach positioned himself on his knees at the back of the box in an attempt to let out his frustrations following an errant clearing kick from Tom Cutler. Or maybe that was a build-up of issues that began not long after Lester shanked his very gettable set shot to the left when the margin was just 11 points. The mood each Monday when players walk into training is consistent, no matter what the result is. What the Lions have worked towards since October has been creating a positive environment, regardless of whether a victory was achieved over the weekend, or what their current win-loss ratio looks like. So when Ryan Lester floated to the front of the pack with 1:50 remaining in the last quarter on Sunday against the Bombers and managed to cling on to an uncontested mark, just a quarter after missing the unmissable, he showed a level of poise by slotting home the sealer to cap a remarkable comeback from a 27-point deficit. While those blunders are frustrating, Fagan will never pick a player out and lambast them for a skill error. It’s about the decision and whether it was the right judgement for the team and the way they intend to play. Chris Fagan has an open-door policy, but that’s no throwaway line. Communication and messaging are buzz words in today’s era, which can be a trying experience when accounting for a list of players that exceeds 40 young men. “You can only pick 22 players, but guys who are playing NEAFL appreciate that what he says to them is really open and honest,” Lester says. Brisbane players are enjoying their football in 2017. That feeling is across the board. While wins have been scarce, there is a bigger picture focus that is not only strategic, but long term. The Lions are seeing little wins along the way, and that was obvious when the group watched a couple of edits last week. One piece of vision showcased their early season play, the other encapsulated their last month, and the improvement was vast. With only three wins from 15 games, it’s little victories that need to be celebrated, like quarters won. In case you’re keeping tally, they’ve claimed 18 out of a possible 60, but seven of those have come in the last five weeks. There’s a correlation between feeling fulfilled off the field, and playing well on it. Geelong, Sydney and Hawthorn have been well-regarded when it comes to developing players on the field, and ensuring they’re motivated in other areas. Up north, there’s been a shift at looking at life after football and taking that more seriously. “We’re trying to be proactive with players by sitting down with them and asking them about their interests away from football,” says Andrew Crowell, who joined the Lions in December as their Head of Personal Excellence and Wellbeing. 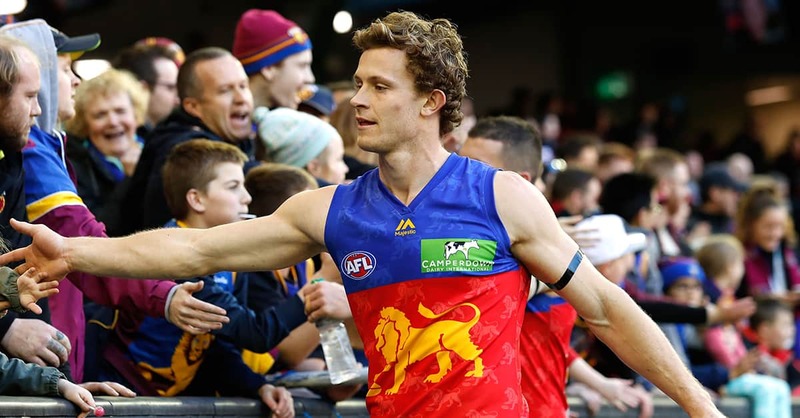 Perhaps these developments seem simplistic and obvious to outsiders, but the fact of the matter is that the Brisbane Lions haven’t excelled in this department in the past. The caring and nurturing environment that exists now simply wasn’t apparent previously. There was a level of impatience and inconsistency towards strategy and direction. “Having someone like David Noble come on board has fine-tuned things,” Crowell continued. Jack Frost spends a day at a V8 Supercar mechanic, Marco Paparone designs t-shirts, Mitch Robinson has bought into a barber shop, Claye Beams, Darcy Gardiner and Sam Mayes are doing apprenticeships. While the football club has bought into the playing group and shown more care, it’s imperative that those who take to the field do the same. Both Fagan and Noble have implemented Leading Teams into the football department, which interestingly enough, was a method the Lions had in place nearly a decade ago, with varying success. The most recent iteration began at the start of this season, and continues on a monthly basis. The leadership group will meet to discuss, and there are all-in meetings that cover the entire playing group. While Lester says, “It’s not rocket science,” he does stress the importance of recognising aspects that haven’t been fruitful previously. Fagan came to the club with a blank canvas when it came to his new players, but the most excruciating decision came relatively early in his tenure. Tom Rockliff had captained the group for two seasons, but relinquished the captaincy as Dayne Beams was appointed to lead the club in 2017. Rather than sulk, Rockliff came back to club in elite condition and performed perhaps his most notable act of leadership behind closed doors. A close friend of both Pearce and Cian Hanley, Rockliff played a supportive hand as the brothers dealt with the toughest moment of their young lives, as Crowell explains. One of the great problems for Brisbane has been player retention, something the Club has recently managed to turn around. Through various departures at the end of the 2013 season, the Lions have yielded Lewis Taylor, Tom Cutler, Dan McStay and Nick Robertson — all of whom have enjoyed a consistent run in the senior team. McStay recently signed on for an extra two years, and their No. 2 selection from the 2015 draft, Josh Schache, showed his commitment by extending until 2019. “Both Josh Schache and Dan McStay were big signings for the club, and particularly Josh,” said Lester. “For Josh to stay sent out a message that there’s a good culture, despite the fact that at the moment he’s playing NEAFL. It was really powerful for us as the Brisbane Lions to become relevant again in the AFL world. “The reality is that we’ve been lost in the last four or five years because we haven’t been finals contenders and we’ve struggled to retain players. Teams probably come up to the Gabba and see it as a chance to get some good weather and get an easy win. This article first appeared on AFL Players.